Welcome to the official website of Cumann LúthchleasGael Baile Bricín/Bothár Mór. 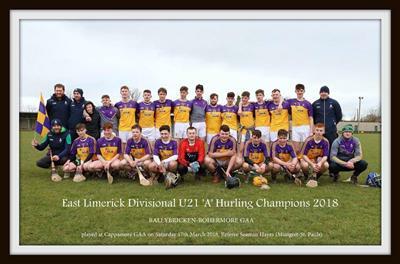 Ballybricken/Bohermore GAA Club is situated inEast Limerick. The club compete in the Intermediate and Junior B hurlingchampionships, and also the Junior A football championship. The club fieldsteams on its own from Under 8 to under 14. From under 16 the club isamalgamated with Kilteely/Dromkeen and compete as Naomh Brid. This amalgamationhas been quite successful with two Minor County football titles won in 2006 and2008, one minor Hurling in 2009 and an under 16 football title in 2011. Message: Well done to the U14 team on winning the county league . A big shout out to Jack & Dan Owens hope your cheering on Co Down on the 22nd july.